Massive, versatile tone and features, but with a useable power level. 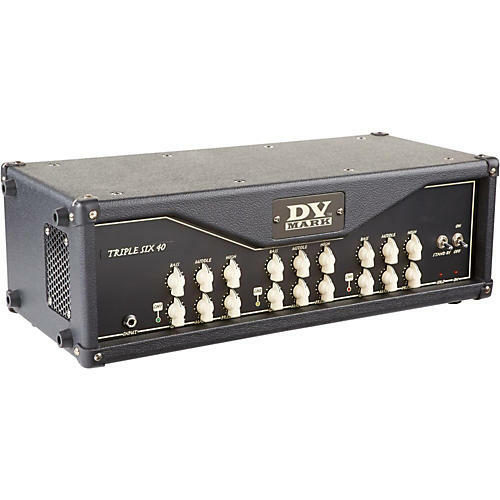 The DV Mark Triple Six 40 is the 40W little brother to the 120W variety, for those who need huge tone, but not the power. The Triple Six 40 features three separate channels and unique preamplifiers in one chassis, and offers a wonderful clean sound on Channel 1, a great crunch sound on Channel 2 (new settings), and a very high-gain distorted lead tone on Channel 3. The built-in Smart Controller allows you to switch channels, activate the Solo function (fixed boost), and control the FX loop. A practical Send level switch allows you to set the signal send to external FX at -10 dB or +4dB. This amp is also equipped with several MIDI ports for great switching options. The Triple Six 40 also features a Dual Voltage Switch 120V/240V to use the amp in countries with different voltages, without having to carry an external converter. Dimensions: 10.35" x 22.63" x 8"